My schedule is even more packed than ever this autumn…I’m traveling to conferences, giving talks (gulp! ), headed out to weddings and even exploring China for the first time. But I still want to savor my favorite season and enjoy the parties and celebrations that come along with it. You can’t make pumpkin-everything all the time so I went in search of a more savory comfort food. I made these incredibleÂ Healthy Vegetarian Sheet Pan Nachos for you and I’ve been enjoying them often because they’re the fastest, most delicious recipe around. Fall means football season. In Seattle we’re all about the Seahawks and UW Huskies – games all the time! We have Sounders soccer going, too so the stadiums seem full every single weekend. I’m not the biggest sports fan, admittedly, but I am a big fan of fall recipes and partying with my friends. The problem with tailgating and watching games together is that the food is soooo unhealthy sometimes. Cheese dips, meaty chili, sweets, candy, chips, soda, beer, pizza, fries and chicken wings seem to dominate every menu. Loaded with that much salt and fat, you may end up feeling terrible after your event. 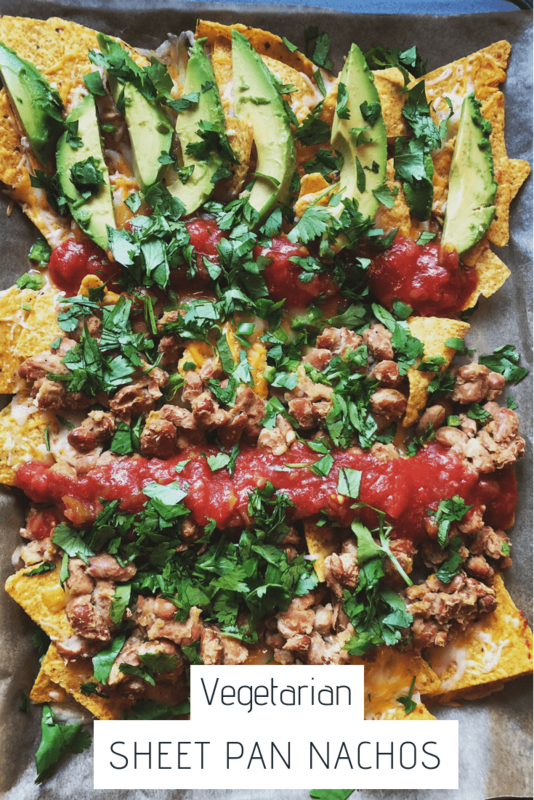 Eating this way can be really hard on some people’s blood pressure or cholesterol levels and it can lead to unwanted weight gain as we head into colder months.Â I’m thrilled that I found a way to lighten up nachos but retain their amazing texture and flavor. Plus (most important to me) they only take about 10 minutes to whip up and have hardly any clean up. Here’s my new favoriteÂ Healthy Vegetarian Sheet Pan Nachos recipe for you this autumn…or anytime you want a decadent snack, appetizer or dinner. If you need more ideas for a lighter sports season, check out my Simple Spicy Vegetarian Chili, No Bake Spinach Artichoke Herb Dip, or Kalamata Olive and Basil Tapenade Dip. Heat oil in a saucepan then add garlic and cook until fragrant and slightly browned. Add beans, 2 Tablespoons of lime juice, salt, chili powder, and cumin. Stir and cook for 3-4 minutes then set aside. Line a large baking pan with parchment paper. Spread chips evenly across the entire pan in a thin layer. Spoon bean mixture evenly over tortilla wedges on baking sheet. If you want to make separate sections, feel free to spread it just over 1/2 or alternate sections of chips. Sprinkle cheese over the top of all chips. Broil 2 minutes or until cheese is melted. Spoon pico de gallo and green salsa alternately in sections over melted cheese. Place avocado slices evenly across nachos. Sprinkle the entire pan with cilantro and serve immediately. Recipe adapted from Jamie Vespa in Cooking Light.